The Bahá'í Faith (Persian: Bahā'i ; بهائی‎‎) is a monotheistic religion which emphasizes the spiritual unity of all humankind. Three core principles establish a basis for Bahá'í teachings and doctrine: the unity of God, that there is only one God who is the source of all creation; the unity of religion, that all major religions have the same spiritual source and come from the same God; and the unity of humanity, that all humans have been created equal, coupled with the unity in diversity, that diversity of race and culture are seen as worthy of appreciation and acceptance. According to the Bahá'í Faith's teachings, the human purpose is to learn to know and to love God through such methods as prayer, reflection, and being of service to humanity. In the Bahá'í Faith, religious history is seen to have unfolded through a series of divine messengers, each of whom established a religion that was suited to the needs of the time and to the capacity of the people. These messengers have included Abrahamic figures—Moses, Jesus, Muhammad, as well as figures from Indian religions like Krishna, Buddha, and others. For Bahá'ís, the most recent messengers are the Báb and Bahá'u'lláh. In Bahá'í belief, each consecutive messenger prophesied of messengers to follow, and Bahá'u'lláh's life and teachings fulfilled the end-time promises of previous scriptures. Humanity is understood to be in a process of collective evolution, and the need of the present time is for the gradual establishment of peace, justice and unity on a global scale. In English language use, the word Bahá'í  is used either as an adjective to refer to the Bahá'í Faith or as a term for a follower of Bahá'u'lláh. The word is not a noun meaning the religion as a whole. It is derived from the Arabic Bahá' (بهاء), meaning "glory" or "splendor", although the word Bahá'í  is actually derived from its use as a loan word in Persian, in particular the "'i" suffix is Persian rather than Arabic. [note 2] The term "Bahaism" (or "Baha'ism") is still used, mainly in a pejorative sense. Three core principles establish a basis for Bahá'í teachings and doctrine: the unity of God, the unity of religion, and the unity of humanity. From these postulates stems the belief that God periodically reveals his will through divine messengers, whose purpose is to transform the character of humankind and to develop, within those who respond, moral and spiritual qualities. Religion is thus seen as orderly, unified, and progressive from age to age. Bahá'í teachings state that God is too great for humans to fully comprehend, or to create a complete and accurate image of, by themselves. Therefore, human understanding of God is achieved through his revelations via his Manifestations. In the Bahá'í religion, God is often referred to by titles and attributes (for example, the All-Powerful, or the All-Loving), and there is a substantial emphasis on monotheism; such doctrines as the Trinity are seen as compromising, if not contradicting, the Bahá'í view that God is single and has no equal. The Bahá'í teachings state that the attributes which are applied to God are used to translate Godliness into human terms and also to help individuals concentrate on their own attributes in worshipping God to develop their potentialities on their spiritual path. According to the Bahá'í teachings the human purpose is to learn to know and love God through such methods as prayer, reflection, and being of service to others. Bahá'í notions of progressive religious revelation result in their accepting the validity of the well known religions of the world, whose founders and central figures are seen as Manifestations of God. Religious history is interpreted as a series of dispensations, where each manifestation brings a somewhat broader and more advanced revelation that is rendered as a text of scripture and passed on through history with greater or lesser reliability but at least true in substance, suited for the time and place in which it was expressed. Specific religious social teachings (for example, the direction of prayer, or dietary restrictions) may be revoked by a subsequent manifestation so that a more appropriate requirement for the time and place may be established. Conversely, certain general principles (for example, neighbourliness, or charity) are seen to be universal and consistent. In Bahá'í belief, this process of progressive revelation will not end; however, it is believed to be cyclical. Bahá'ís do not expect a new manifestation of God to appear within 1000 years of Bahá'u'lláh's revelation. The Bahá'í writings state that human beings have a "rational soul", and that this provides the species with a unique capacity to recognize God's station and humanity's relationship with its creator. Every human is seen to have a duty to recognize God through His messengers, and to conform to their teachings. Through recognition and obedience, service to humanity and regular prayer and spiritual practice, the Bahá'í writings state that the soul becomes closer to God, the spiritual ideal in Bahá'í belief. When a human dies, the soul passes into the next world, where its spiritual development in the physical world becomes a basis for judgment and advancement in the spiritual world. Heaven and Hell are taught to be spiritual states of nearness or distance from God that describe relationships in this world and the next, and not physical places of reward and punishment achieved after death. With specific regard to the pursuit of world peace, Bahá'u'lláh prescribed a world-embracing collective security arrangement as necessary for the establishment of a lasting peace. The Bahá'í teachings speak of both a "Greater Covenant", being universal and endless, and a "Lesser Covenant", being unique to each religious dispensation. The Lesser Covenant is viewed as an agreement between a Messenger of God and his followers and includes social practices and the continuation of authority in the religion. At this time Bahá'ís view Bahá'u'lláh's revelation as a binding lesser covenant for his followers; in the Bahá'í writings being firm in the covenant is considered a virtue to work toward. The Greater Covenant is viewed as a more enduring agreement between God and humanity, where a Manifestation of God is expected to come to humanity about every thousand years, at times of turmoil and uncertainty. With unity as an essential teaching of the religion, Bahá'ís follow an administration they believe is divinely ordained, and therefore see attempts to create schisms and divisions as efforts that are contrary to the teachings of Bahá'u'lláh. Schisms have occurred over the succession of authority, but any Bahá'í divisions have had relatively little success and have failed to attract a sizeable following. The followers of such divisions are regarded as Covenant-breakers and shunned, essentially excommunicated. The canonical texts are the writings of the Báb, Bahá'u'lláh, `Abdu'l-Bahá, Shoghi Effendi and the Universal House of Justice, and the authenticated talks of `Abdu'l-Bahá. 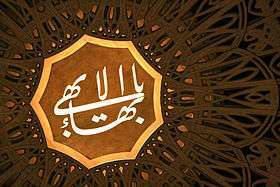 The writings of the Báb and Bahá'u'lláh are considered as divine revelation, the writings and talks of `Abdu'l-Bahá and the writings of Shoghi Effendi as authoritative interpretation, and those of the Universal House of Justice as authoritative legislation and elucidation. Some measure of divine guidance is assumed for all of these texts. Some of Bahá'u'lláh's most important writings include the Kitáb-i-Aqdas, literally the Most Holy Book, which is his book of laws, the Kitáb-i-Íqán, literally the Book of Certitude, which became the foundation of much of Bahá'í belief, the Gems of Divine Mysteries, which includes further doctrinal foundations, and the Seven Valleys and the Four Valleys which are mystical treatises. Bahá'í history follows a sequence of leaders, beginning with the Báb's declaration in Shiraz, Iran on the evening of 22 May 1844, and ultimately resting on an administrative order established by the central figures of the religion. The Bahá'í community was mostly confined to the Persian and Ottoman empires until after the death of Bahá'u'lláh in 1892, at which time he had followers in 13 countries of Asia and Africa. Under the leadership of his son, `Abdu'l-Bahá, the religion gained a footing in Europe and America, and was consolidated in Iran, where it still suffers intense persecution. After the death of `Abdu'l-Bahá in 1921, the leadership of the Bahá'í community entered a new phase, evolving from a single individual to an administrative order with both elected bodies and appointed individuals. On the evening of 22 May 1844, Siyyid `Alí-Muhammad of Shiraz, Iran proclaimed that he was "the Báb" (الباب "the Gate"), referring to his later claim to the station of Mahdi, the Twelfth Imam of Shi`a Islam. His followers were therefore known as Bábís. As the Báb's teachings spread, which the Islamic clergy saw as a threat, his followers came under increased persecution and torture. The conflicts escalated in several places to military sieges by the Shah's army. The Báb himself was imprisoned and eventually executed in 1850. 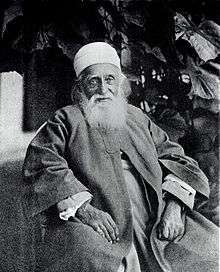 Mírzá Husayn `Alí Núrí was one of the early followers of the Báb, and later took the title of Bahá'u'lláh. He was arrested and imprisoned for this involvement in 1852. Bahá'u'lláh relates that in 1853, while incarcerated in the dungeon of the Síyáh-Chál in Tehran, he received the first intimations that he was the one anticipated by the Báb. In 1868 Bahá'u'lláh was banished by Sultan Abdülâziz a final time to the Ottoman penal colony of `Akká, in present-day Israel. Towards the end of his life, the strict and harsh confinement was gradually relaxed, and he was allowed to live in a home near `Akká, while still officially a prisoner of that city. He died there in 1892. Bahá'ís regard his resting place at Bahjí as the Qiblih to which they turn in prayer each day. Bahá'u'lláh wrote many written works taken as scripture in the religion of which only a fraction have been translated into English. There have been 15,000 works both small and large noted – the most significant of which are the Most Holy Book, the Book of Certitude, the Hidden Words, and the Seven Valleys. There is also a series of compilation volumes of smaller works the most significant of which is the Gleanings from the Writings of Bahá'u'lláh. It is estimated that `Abdu'l-Bahá wrote over 27,000 works mostly in the form of letters of which only a fraction have been translated into English. Among the more well known are The Secret of Divine Civilization, the Tablet to Auguste-Henri Forel, and Some Answered Questions. Additionally notes taken of a number of his talks were published in various volumes like Paris Talks during his journeys to the West. From its origins in the Persian and Ottoman Empires, by the early 20th century there were a number of converts in South and South East Asia, Europe, and North America. During the 1950s and 1960s, vast travel teaching efforts brought the religion to almost every country and territory of the world. By the 1990s, Bahá'ís were developing programs for systematic consolidation on a large scale, and the early 21st century saw large influxes of new adherents around the world. The Bahá'í Faith is currently the largest religious minority in Iran, Panama, and Belize; the second largest international religion in Bolivia, Zambia, and Papua New Guinea; and the third largest international religion in Chad and Kenya. 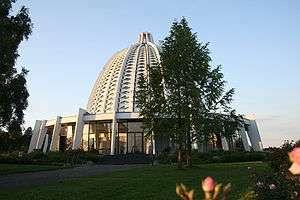 The Bahá'í Faith is a medium-sized religion and was listed in The Britannica Book of the Year (1992–present) as the second most widespread of the world's independent religions in terms of the number of countries represented. According to Britannica, the Bahá'í Faith (as of 2002) is established in 247 countries and territories; represents over 2,100 ethnic, racial, and tribal groups; has scriptures translated into over 800 languages; and has an estimated seven million adherents worldwide. Additionally, Bahá'ís have self-organized in most of the nations of the world. The laws of the Bahá'í Faith primarily come from the Kitáb-i-Aqdas, written by Bahá'u'lláh. The following are a few examples of basic laws and religious observances. Prayer in the Bahá'í Faith consists of obligatory prayer and devotional (general) prayer. Bahá'ís over the age of 15 must individually recite an obligatory prayer each day, using fixed words and form. In addition to the daily obligatory prayer, believers are directed to daily offer devotional prayer and to meditate and study sacred scripture. There is no set form for devotions and meditations, though the devotional prayers written by the central figures of the Bahá'í Faith and collected in prayer books are held in high esteem. Reading aloud of prayers from prayer books is a typical feature of Bahá'í gatherings. Adult Bahá'ís in good health should observe a nineteen-day sunrise-to-sunset fast each year from 2 March through 20 March. Adherence to ritual is discouraged, with the notable exception of the obligatory prayers. While some of the laws from the Kitáb-i-Aqdas are applicable at the present time and may be enforced to a degree by the administrative institutions, Bahá'u'lláh has provided for the progressive application of other laws that are dependent upon the existence of a predominantly Bahá'í society. The laws, when not in direct conflict with the civil laws of the country of residence, are binding on every Bahá'í, and the observance of personal laws, such as prayer or fasting, is the sole responsibility of the individual. The purpose of marriage in the Bahá'i faith is mainly to foster spiritual harmony, fellowship and unity between a man and a woman and to provide a stable and loving environment for the rearing of children. The Bahá'í teachings on marriage call it a fortress for well-being and salvation and place marriage and the family as the foundation of the structure of human society. Bahá'u'lláh highly praised marriage, discouraged divorce and homosexuality, and required chastity outside of marriage; Bahá'u'lláh taught that a husband and wife should strive to improve the spiritual life of each other. Interracial marriage is also highly praised throughout Bahá'í scripture. Monasticism is forbidden, and Bahá'ís attempt to ground their spirituality in ordinary daily life. Performing useful work, for example, is not only required but considered a form of worship. Bahá'u'lláh prohibited a mendicant and ascetic lifestyle. The importance of self-exertion and service to humanity in one's spiritual life is emphasised further in Bahá'u'lláh's writings, where he states that work done in the spirit of service to humanity enjoys a rank equal to that of prayer and worship in the sight of God. Most Bahá'í meetings occur in individuals' homes, local Bahá'í centers, or rented facilities. Worldwide, there are currently seven Bahá'í Houses of Worship, with an eighth near completion  in Chile, and a further seven planned as of April 2012. Bahá'í writings refer to an institution called a "Mashriqu'l-Adhkár" (Dawning-place of the Mention of God), which is to form the center of a complex of institutions including a hospital, university, and so on. 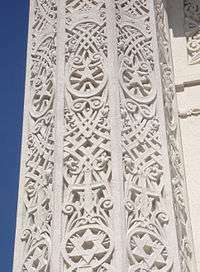 The first ever Mashriqu'l-Adhkár in `Ishqábád, Turkmenistan, has been the most complete House of Worship. The five-pointed star is the symbol of the Bahá'í Faith. 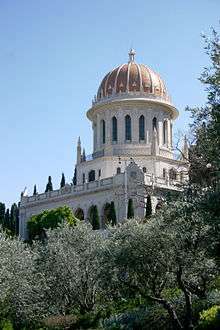 In the Bahá'í Faith, the star is known as the Haykal (Arabic: "temple"‎‎), and it was initiated and established by the Báb. The Báb and Bahá'u'lláh wrote various works in the form of a pentagram. Bahá'ís continue to be persecuted in Islamic countries, as Islamic leaders do not recognize the Bahá'í Faith as an independent religion, but rather as apostasy from Islam. The most severe persecutions have occurred in Iran, where over 200 Bahá'ís were executed between 1978 and 1998, and in Egypt. The rights of Bahá'ís have been restricted to greater or lesser extents in numerous other countries, including Afghanistan, Indonesia, Iraq, Morocco, and several countries in sub-Saharan Africa. The marginalization of the Iranian Bahá'ís by current governments is rooted in historical efforts by Muslim clergy to persecute the religious minority. When the Báb started attracting a large following, the clergy hoped to stop the movement from spreading by stating that its followers were enemies of God. These clerical directives led to mob attacks and public executions. Starting in the twentieth century, in addition to repression that impacted individual Bahá'ís, centrally directed campaigns that targeted the entire Bahá'í community and its institutions were initiated. In one case in Yazd in 1903 more than 100 Bahá'ís were killed. 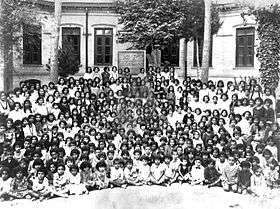 Bahá'í schools, such as the Tarbiyat boys' and girls' schools in Tehran, were closed in the 1930s and 1940s, Bahá'í marriages were not recognized and Bahá'í texts were censored. 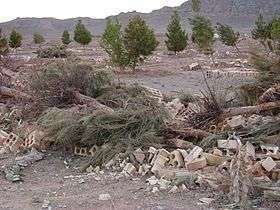 Since the Islamic Revolution of 1979 Iranian Bahá'ís have regularly had their homes ransacked or have been banned from attending university or from holding government jobs, and several hundred have received prison sentences for their religious beliefs, most recently for participating in study circles. Bahá'í cemeteries have been desecrated and property has been seized and occasionally demolished, including the House of Mírzá Buzurg, Bahá'u'lláh's father. The House of the Báb in Shiraz, one of three sites to which Bahá'ís perform pilgrimage, has been destroyed twice. The Iranian government claims that the Bahá'í Faith is not a religion, but is instead a political organization, and hence refuses to recognize it as a minority religion. However, the government has never produced convincing evidence supporting its characterization of the Bahá'í community. Also, the government's statements that Bahá'ís who recanted their religion would have their rights restored, attest to the fact that Bahá'ís are persecuted solely for their religious affiliation. 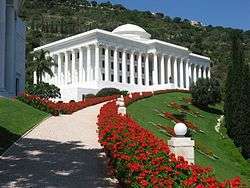 The Iranian government also accuses the Bahá'í Faith of being associated with Zionism because the Bahá'í World Centre is located in Haifa, Israel. [note 7] These accusations against the Bahá'ís have no basis in historical fact,  and the accusations are used by the Iranian government to use the Bahá'ís as "scapegoats". In fact it was the Iranian leader Naser al-Din Shah Qajar who banished Bahá'u'lláh from Persia to the Ottoman Empire and Bahá'u'lláh was later exiled by the Ottoman Sultan, at the behest of the Persian Shah, to territories further away from Iran and finally to Acre in Syria, which only a century later was incorporated into the state of Israel. ↑ Bahá'ís prefer the orthographies Bahá'í , Bahá'ís, the Báb, Bahá'u'lláh, and `Abdu'l-Bahá , using a particular transcription of the Arabic and Persian in publications. "Bahai", "Bahais", "Baha'i", "the Bab", "Bahaullah" and "Baha'u'llah" are often used when diacriticals are unavailable. ↑ All Ridván messages can be found at Bahá'í Library Online. 1 2 3 4 5 6 7 8 Hutter 2005, pp. 737–740. 1 2 3 4 5 6 Affolter January 2005, pp. 75–114. 1 2 Smith 2008, p. 56. ↑ Hutter 2005, pp. 737–40. ↑ Smith 2008, pp. 107–9. ↑ Principles of the Bahá'í Faith 26 March 2006. 1 2 3 Universal House of Justice September 2002, pp. 349–350. ↑ Smith 2000, pp. 79–80. ↑ Universal House of Justice 17 January 2003. ↑ Vahedi 2 March 2011. ↑ Universal House of Justice 21 April 2010. ↑ Rabbani July 1987, pp. 2–7. 1 2 3 International Federation of Human Rights August 2003. ↑ Lewis, James R (2008). Scientology. Oxford University Press. p. 118. 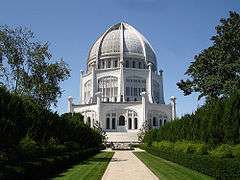 Baha'i ... is a medium-sized religion of seven million adherents. ↑ Foreign Policy Magazine 1 May 2007. 1 2 Smith 2000, pp. 223–225: "Law"
↑ Smith 2008, pp. 158–161. ↑ Watkins, Katie. "In Progress: Bahá'í Temple of South America / Hariri Pontarini Architects". archdaily.com. Arch Daily. Retrieved 2 February 2016. ↑ Adherents 18 October 2001. ↑ Bahá'í World News Service 22 April 2012. 1 2 Bahá'í International Community 6 June 2000. ↑ Bahá'í World News Service 8 September 2000. ↑ Netherlands Institute of Human Rights 8 March 2006. 1 2 CNN 16 May 2008. ↑ Sullivan 8 December 2009. ↑ Iran Human Rights Documentation Center 15 May 2008. 1 2 CNN 12 January 2010. ↑ Washington TV 20 January 2010. ↑ Djavadi 8 April 2010. ↑ Radio Free Europe 3 June 2010. ↑ CNN 16 September 2010. ↑ AFP 16 February 2011. ↑ AFP 31 March 2011. ↑ The Jerusalem Post 14 February 2010. ↑ Freedman 26 June 2009. ↑ Bigelow 16 November 2005. ↑ Bahá'í World News Service 17 April 2009. ↑ Bahá'í World News Service 14 August 2009. "Worldwide Adherents of All Religions by Six Continental Areas, Mid-2002". Encyclopædia Britannica. 2002. Archived from the original on 12 December 2007. Retrieved 31 May 2006. Gervais, Marie (2008). "Baha'i Faith and Peace Education" (PDF). Encyclopedia of Peace Education. New York: Teachers College, Columbia University. Archived from the original (PDF) on 28 September 2013. Retrieved 25 September 2013. "Bahaism". The American Heritage Dictionary of the English Language (4th ed.). Houghton Mifflin Company. 2004. ISBN 0-395-71146-0. Stockman, Robert (2006). "Baha'i Faith". In Riggs, Thomas. Worldmark Encyclopedia of Religious Practices. Retrieved 23 January 2015.